Hope you all had a great Thanksgiving holiday! 感恩節快樂!! A big thank you to our teachers and staff. You make a positive difference at our school each week!! In celebration of NWCS’ 50th anniversary, we have compiled an exciting list of raffle prizes! In fact, this year we have TWO separate raffles – one for the parents, and one for the kids. The grand prize for the parent’s raffle is two round trip tickets on JetBlue. Tickets prices are as follows: 1 for $20, 2 for $30, and 5 for $50. The grand prize for the student’s raffle is the Nintendo Switch. Ticket prices are as follows: 1 for $4, 3 for $10, and 10 for $20. See attached flyer for the rest of the great prizes, and please support NWCS by buying your tickets. Who knows, you might just win! We will also continue to add prizes as they become available. If you have anything you’d like to donate, please let Wei know at chairperson@nwcsny.org. REMINDER TO STUDENTS: This is also a great time to revive those conversation cards. Remember, if you complete the cards with 20 signatures, you can earn 5 raffle tickets towards the students raffle! Lost your conversation card? We are happy to distribute more cards if needed – just let us know. 林詠雯 (Rebecca Lim) and family attended the ACS awards ceremony at the Culture Center of Taipei in Flushing on Nov 17th. The Culture Center’s directors personally gave out the first place calligraphy award to Rebecca. Thank you to the Lim family for representing NWCS! A big thank you to Ke-Wei Chang, Fu-Hsuan Chiu, Harry Villareal, Kenny Soohoo, and Rick Chan for being our class photographers last week! We really appreciate your involvement. We will share these great pictures with you all at the 50th anniversary slideshow, and at our next open house! Please save the date on January 12th from mid-afternoon to dinner for our Chinese New Year and 50th anniversary celebration! Each class will be asked to contribute either hot or cold cups, small or large plates, water bottles or juice boxes for the party. Mike Yin, our class liaison and board member, will be coordinating with the class parents on supply assignments. Class parents, please be prepared to reach out to other parents in the class to gather these needed supplies. We are counting on all of you to help! For your holiday shopping, please designate NWCS as your charitable organization of choice via AmazonSmile or shop on Amazon.com via www.nwcsny.org website. This is an easy way to support our school (school gets a small donation for each purchase made via the link). I hope everyone had a happy and safe Halloween! Thanks to all the kids and adults that wore their awesome costumes last Saturday. 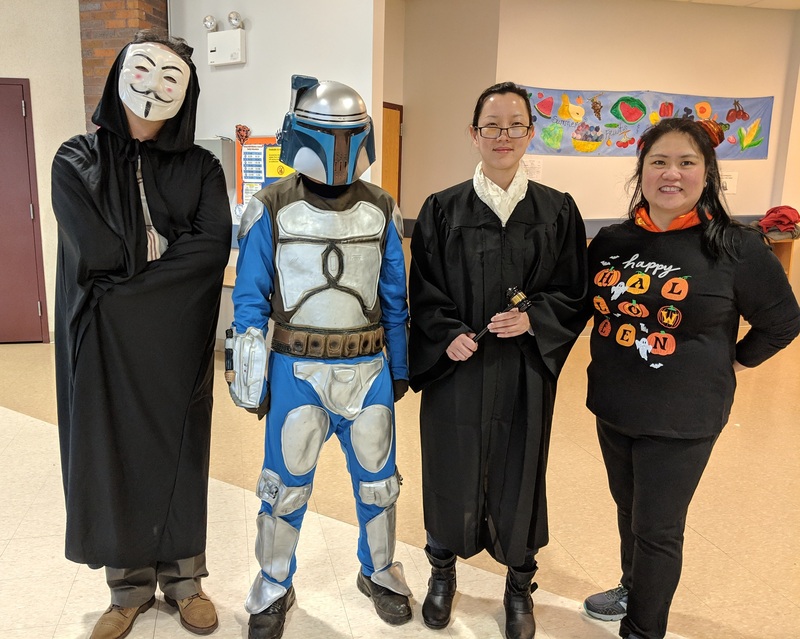 Here is a picture of some staff members who dressed up too. Please volunteer to be a class parent! We and the teachers would love to have your help with school events involving your children. Your participation would be greatly appreciated. We will be celebrating Halloween this Saturday. Everyone is welcome to wear a costume! I will be giving out treats to students, especially the ones who can say 萬聖節快樂 (Happy Halloween in Chinese) to me. A big thank you to our co-board chairperson, David Quinn, for his book reading event to raise funds for NWCS earlier this month. 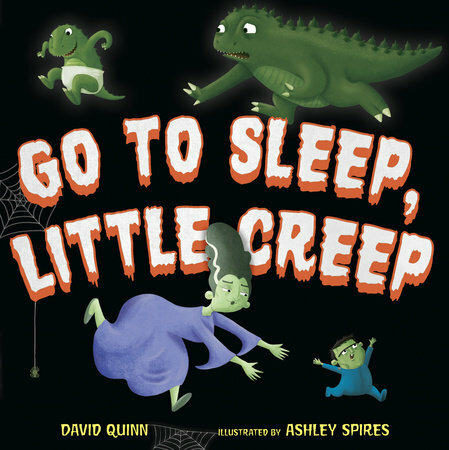 David’s clever new book for kids, Go to Sleep, Little Creep, is a warm, funny rhyming picture book that transports us to a make-believe Halloween Night World where Monster Parents struggle to cuddle and calm their little ghosts, zombies, creatures and creeps for a good night’s – well, actually, it’s a good day’s – sleep. You can purchase David’s book on Amazon here. Please consider designating NWCS as your charitable organization of choice via AmazonSmile or shop on Amazon.com via www.nwcsny.org website. Thank you in advance for your support! A few quick reminders about Week 6. Most classes are having their parent teacher conferences this Saturday. Kindly reserve a time slot with your child’s teachers to exchange feedback. Please also feel free to reach out to any school officers if you have any suggestions for school operations and curriculum. We aim to continuously make improvements but need your inputs and involvement to make them happen! NWCS will broadcast school closings or emergency notifications by text via Remind (thanks to Mr. Harry Villareal, our Webmaster and Board member)! You’ll receive a welcome text from Remind. Briarcliff school has informed us that parking will be very full this Saturday morning. They would very much appreciate it if we all can park in the back of the school building (turn left by the entrance guard post). The rear doors will be open so we can enter the school from the back (softball fields). We will also have volunteers to direct traffic that morning to make this process easier. Kindly also park in the designated area only to avoid any complaints from bus companies or school sports teams. Please remind your child(ren) to bring their conversation cards on Saturday. Have them talk to parent and teacher volunteers with the “come speak to me” sign to gain points toward prizes! Some parents have children books in Chinese that their kids have outgrown. We thought it would be great to pass these books to younger NWCS students. If you have books in good condition, please feel free to bring them to the cafeteria on Saturdays to see if they can be free-cycled! 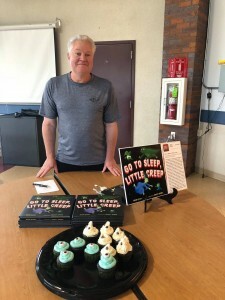 Halloween Fun starts this Saturday as our own parent volunteer and co-chair David Quinn will set up in the cafeteria all morning to discuss, sell, sign — and at 11am, read — his clever new book for kids, Go to Sleep, Little Creep. This warm, funny rhyming picture book transports us to a make-believe Halloween Night World where Monster Parents struggle to cuddle and calm their little ghosts, zombies, creatures and creeps for a good night’s – well, actually, it’s a good day’s – sleep. 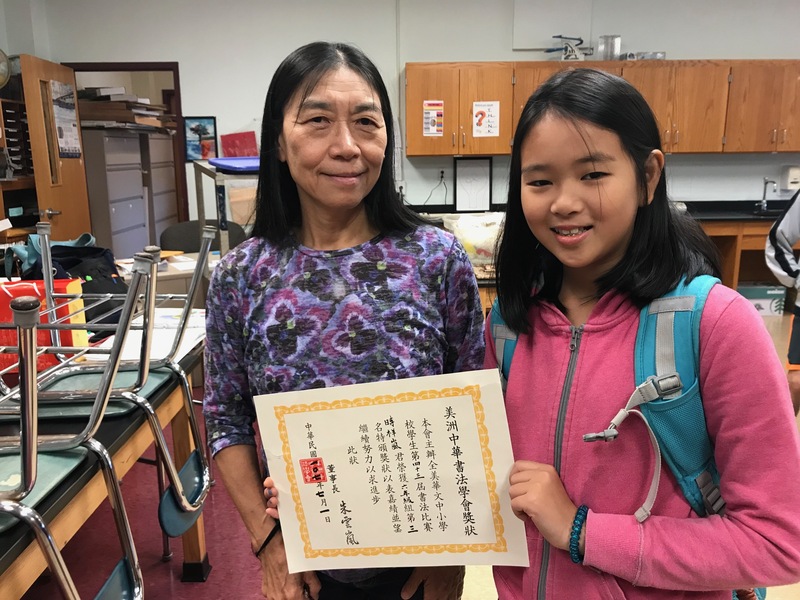 Our very own 6th grader, Charlotte Shih (時祥嵐), won 3rd place in the 2018 Chinese calligraphy contest in her age group. The contest is sponsored by the Association of Chinese Calligraphy in America(美洲中華書法學會). Congratulations to Charlotte and her teacher, Ms. Daisy Rose, on this honor! 恭喜沈老師及高徒時祥嵐!! Our students had a great time with the new conversation card game last week. I am particularly impressed by two students, one collected all 20 signatures and one collected almost 20, on the first day. Well done!! For anyone else who wants to follow their footsteps, if you collect all 20 signatures by this Saturday, you can get an extra treat from the Breakfast Club on me! A big thank you to our co-chairperson Weifang Lin, our dean HC Wang, and Dr. Ifay Chang for putting this card game together! Welcome to Week 3! Tomorrow, Sep 28, is Confucius’s birthday and also teacher’s appreciation day at our school . Many Chinese cultural traits are deeply influenced by Confucius’s teachings, particularly reverence for educators who pass down knowledge and morality from generation to generation. When you see our teachers this Saturday, please say thank you (謝謝老師 )! 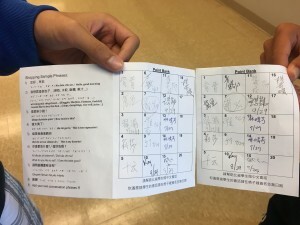 As mentioned during week one, we are piloting a new game to encourage kids to speak more Chinese during their time in Chinese school, which will hopefully translate to more Chinese outside of Chinese school as well! Starting this week, each student will receive a conversation card, with sample phrases, and space to gather points. 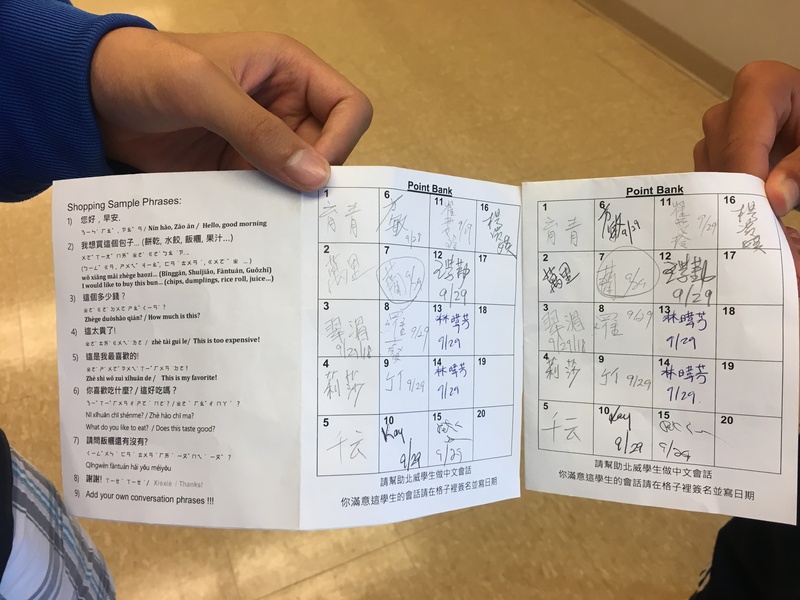 Students can speak to any Chinese speaking parent or staff member with the “speak to me” sticker before class, during break time, or after class, using the sample phrases or other phrases of their choice, to earn points. 10 points = free treat at breakfast club. 20 points = 2nd free treat, or 5 raffle tickets. The first topic is “Shopping,” with phrases related to buying food from breakfast club! More topics to come later in the year. Each week we will also set up a table in the cafeteria with a “come speak to me” sign and have a couple of parents stationed there during break, to make it easier to find. After your child gets their snack, they are welcome to come sit at the table and chat and eat at the same time. We will need Chinese speaking parent volunteers for this! Please contact Wei at chairperson@nwcsny.org if you would like to volunteer. It’s a great, easy way to get involved, and help our students speak Chinese! Save the Date: Saturday, October 6! 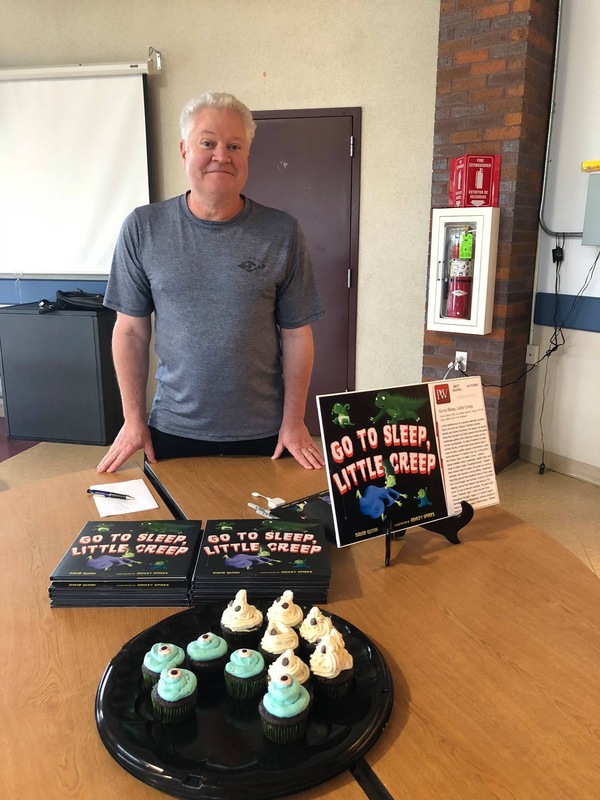 Halloween Fun starts early this year as our own parent volunteer and co-chair David Quinn will set up in the cafeteria all morning to sell, sign and read his clever new book for kids, Go to Sleep, Little Creep. If you already bought the book — it’s discounted on Amazon Smile —bring your copy for David to personalize. Or you can buy one from him Saturday. Proceeds will benefit our special fund to help pay for our NWCS 50th Anniversary Celebration January 12. 感謝大家的支持！Welcome back everyone. It was great seeing you all together at the general assembly! I especially want to thank our teachers, board members and staff for a successful start to the school year. If you have any suggestions for future assemblies and open houses, please feel free to let me know! Also want to wish you all a Happy Mid-Autumn Festival! It falls on this coming Monday, Sept. 24th. May the full moon bring you much happiness and success. 祝福中秋佳節快樂! 願您的生活就像滿月一樣，圓圓滿滿的 ! Classes – As teachers evaluate their classes, there may be some movement from class to class in the first few weeks. We will let families know if any changes are recommended. In addition, if your child(ren) speaks with you about the current level being too difficult or too easy, please let your teacher, Dean, and myself know so that we can assess right away. Electives – Please encourage your kids to visit and sign up for the enriching electives in the 3rd hour. We often hear back from many students how much they enjoy the fun electives. If you have any questions regarding registration, please contact our registrar, Ms. David Chan, at registrar@nwcsny.org. NWCS also communicates over emails on school news and activities. If you know people, especially new families, who are not getting this email, please have them contact our webmaster at webmaster@nwcsny.org. 歡迎大家來到北威中文學校! This Saturday, September 15th, is the first day of Chinese school for the Fall 2018 semester. It also marks the 50th anniversary of Northern Westchester Chinese School. We are so happy to have you in our NWCS community for this momentous year! Over the past five decades, we have educated thousands of students from Pre-K to 12th grade. I also want to take this moment to salute our current and previous deans, teachers, board members, and staff for their contributions to our school and for laying the foundation for our continued success. In preparation for the first day of school, please see below for a few important announcements. We will start school’s opening assembly at 9am sharp in the middle school gym. Kindly remember to pick up a welcome packet for your family which contains important information relevant to the school. Students will meet their respective teachers and then walk to the classrooms together. We aim to have the students in their classrooms by 9:15am after reviewing school safety policy and classroom etiquette. Break as usual is at 10am and our languages classes end at 11 am. Electives are great way to meet students from other classes, learn something new, and do something fun. All students are welcomed to take or tour the electives from 11am to noon. I especially encourage the younger grades kids to sign up for our electives! We will also hold an open house from 10-11am for prospective families. Here is the info for the open house. Extra Credit Homework for all: kindly post the open house banner on your facebook, snapshot, or other social media groups you belong to. Please also print out copies of the fliers and hang them on public bulletin boards. Help NWCS spread the word! Each teacher has been asked to elect a class parent to help with events coordination and school communication chain. Please consider nominating yourself! This school depends on volunteers. Your active participation would be greatly appreciated. In preparation of the first day of class, kindly remind the kids to finish their summer work assignments and review what was learnt last year. For kids that have completed their summer homework assignments, they will be awarded 10 raffle tickets (pending teacher’s verification). You can find the 2018-2019 school calendar here. If you have any questions regarding registration, please contact our registrar, Mr. David Chan, at registrar@nwcsny.org or me. 北威中文學校歡迎您！ Welcome to Northern Westchester Chinese School! See a list of overseas Chinese language summer camps. See a list of Chinese summer camps in the US.